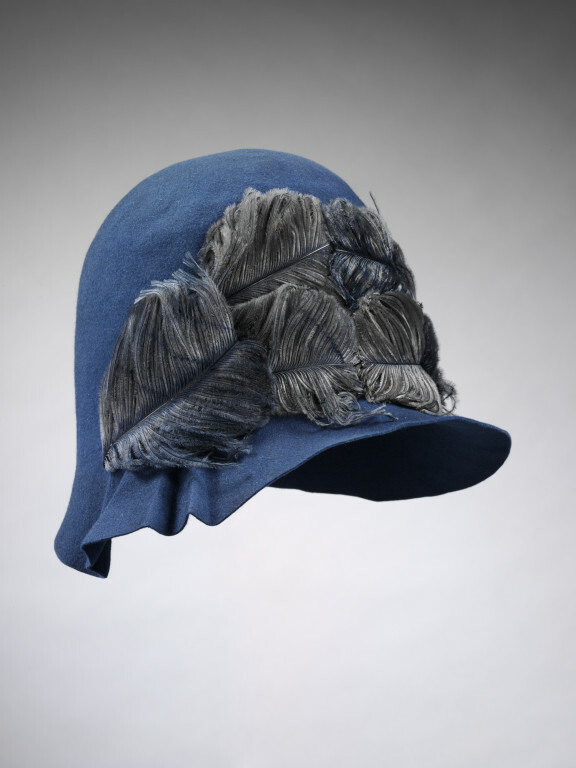 This cloche hat was worn as part of an ensemble by Marian Hazel Lasenby for her wedding to William Moorcroft in 1928. The close-fitting cloche hat was extremely popular at the time. A simple modern design, it was an easy to wear unfussy style of hat which fitted snugly over fashionably closely-cropped hairstyles. The decoration on this hat consists of blue ostrich feathers which are cleverly bound around the hat, keeping the tight-fitting silhouette but adding an element of decorative movement. 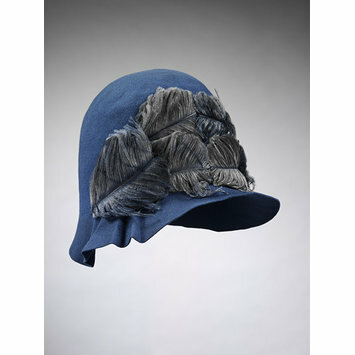 Cloche hat of mid-blue felt trimmed with mid-blue ostrich feathers. Lined with fine cream silk taffeta with a drawstring adjustment. This outfit was especially designed and made by Liberty's for Marian Hazel Lasenby to wear for her marriage in 1928 to the potter William Moorcroft (1872-1945). It was William Moorcroft's second marriage. Marian Lasenby decided not to wear white when she married the potter William Moorcroft in 1928. Her husband was a widower and 27 years her senior. Instead she ordered a dress with a hat and matching reversible coat from Liberty's. She was related to the Lasenby Liberty family who owned the popular department store.